It never ceases to amaze me how people can turn the simplest of things into art. Steven J. Backman, of San Francisco, CA, has been making toothpick art since he was a child. 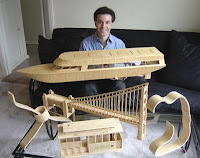 Eventually he turned the hobby into a business, Landmarks of San Francisco, selling toothpick recreations of historical cable cars and other landmarks. His most famous piece is a 13-foot replica of the Golden Gate Bridge that took over 30,000 toothpicks and 2-1/2 years to build. It is currently on display at Ripley's Believe It or Not Museum in Hollywood, CA. 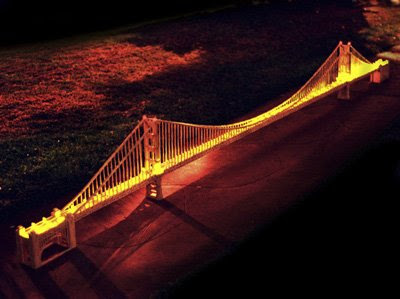 The bridge is illuminated with more than 100 LED lights. 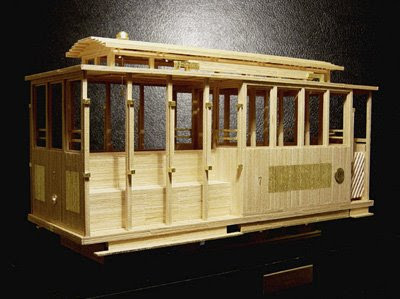 This cable car is 16" long and made up of 4,000 toothpicks. 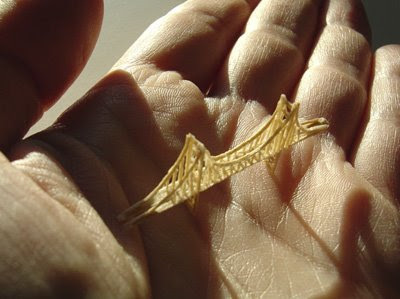 This replica of the Golden Gate Bridge is made from just one toothpick and is less than 2" long. You're so clever at finding fantastic miniature art on the internet! I always enjoy looking at your newest finds! This is so cool and amazing. This guy is really dedicated to his art and I find what he does not only fascinating but also very motivating to artists around the world. Beautiful work, thanks for posting your link!